Introduction: This is a unique case of a pheochromocytoma secreting both ACTH and CRH. Pheochromocytomas secreting either CRH or ACTH have been reported in the literature and are a rare cause of Cushingâ€™s syndrome. To date, there are no reports of a pheochromocytoma producing both hormones. Background: A 38-yr-old previously healthy female presented with a 2 week history of anasarca, headache and severe hypertension (SBP 200-250mmHg). Evaluation revealed evidence of pheochromocytoma and Cushing’s syndrome (Table 1); an abdominal MRI showed a 4-cm left adrenal mass and right adrenal hyperplasia. 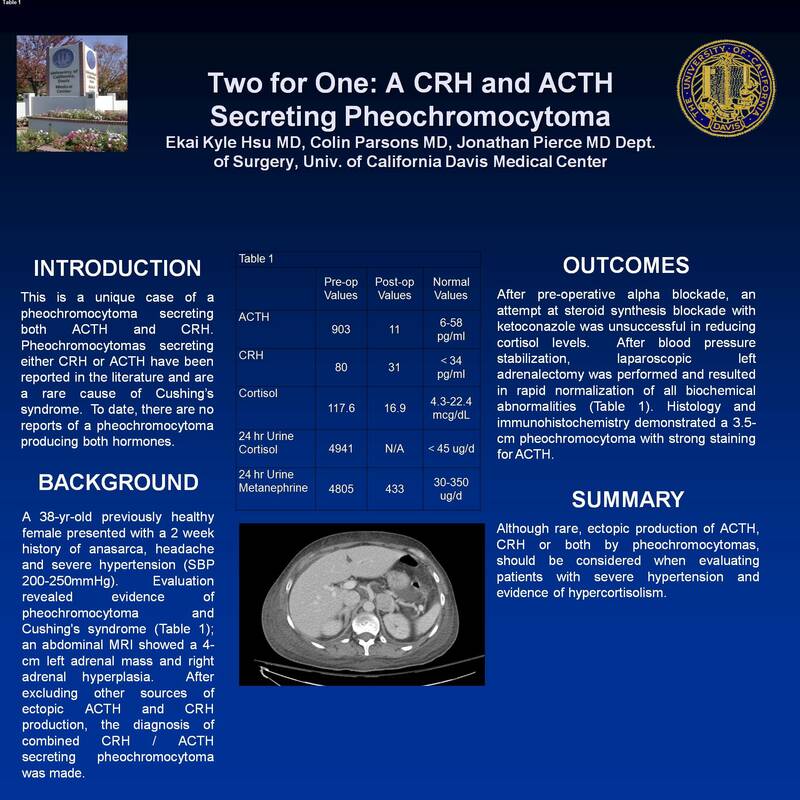 After excluding other sources of ectopic ACTH and CRH production, the diagnosis of combined CRH / ACTH secreting pheochromocytoma was made. Outcome: After pre-operative alpha blockade, an attempt at steroid synthesis blockade with ketoconazole was unsuccessful in reducing cortisol levels. After blood pressure stabilization, laparoscopic left adrenalectomy was performed and resulted in rapid normalization of all biochemical abnormalities (Table 1). Histology and immunohistochemistry demonstrated a 3.5-cm pheochromocytoma with strong staining for ACTH. Summary: Although rare, ectopic production of ACTH, CRH or both by pheochromocytomas, should be considered when evaluating patients with severe hypertension and evidence of hypercortisolism.